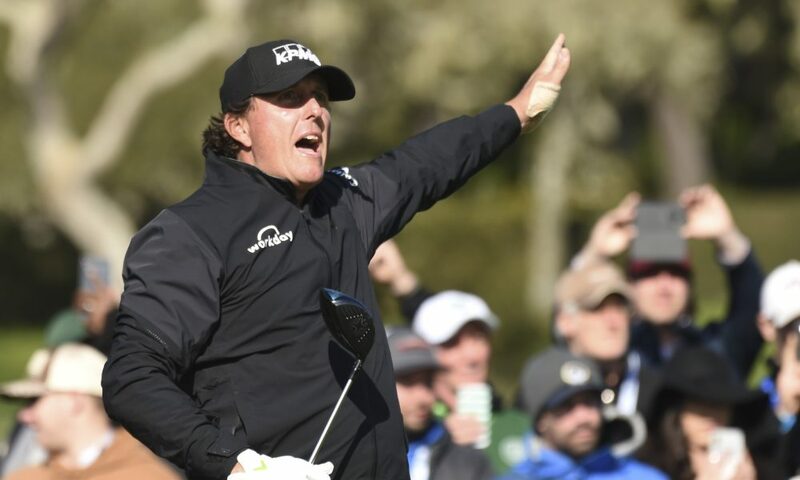 Phil Mickelson leads the AT&T Pebble Beach Pro-Am by three shots with two holes to play after the final round was suspended because of fading light. The American is on 18 under with two holes left to play, with playing partner Paul Casey on 15 under. With light fading, Mickelson was keen to finish the round, saying: “I can see fine” but England’s Casey opted not to putt on the 16th. “I get exactly where Paul is coming from,” Mickelson later said. The start of the day’s play was delayed by an hour for rain and stopped again for two hours as a hailstorm hit the California course. American Scott Stallings holds the clubhouse lead on 15 under after his six-under par 66, with Jason Day finished on 13 under, level with South Korea’s Kim Si-woo. Overnight leader Casey had a three-shot advantage over Mickelson at the start of the day, but the five-time major winner made up the deficit with three birdies in the front nine and three more after the turn. Phil Mickelson was closing in on a fifth win at the AT&T Pebble Beach Pro-Am in California when play was suspended due to darkness. The American, who started the final round at Pebble Beach three shots back, ended with a three-shot lead with two holes left to play. After a rain-delayed start, Mickelson had produced a blemish-free round and holed six birdies to move to 18 under before play was called off. Third-round leader Paul Casey, who mixed two bogeys with two birdies, was at 15 under with three holes remaining, tied with Scott Stallings who finished with a 66. Australian Jason Day and Si Woo Kim, of South Korea, were in the clubhouse on 13 under. Scot Russell Knox closed at nine under after a fourth-round level-par 72, one shot clear of Northern Irishman Graeme McDowell. This entry was posted in Golf News. Bookmark the permalink. Golf Direct will match the price of any other UK authorised online retailers. We're always confident about our pricing, but if you find one of the competitors listed above has the same product cheaper please do give us a call on 0333 800 7272. WHEN YOU ARE WANTING NEW GOLF EQUIPMENT OR YOU'RE LOOKING FOR A GOLFING GIFT, THEN GOLF DIRECT HAS WHAT YOU'RE LOOKING FOR. © 2017 Golf DirectThe number one online golf equipment store.